They're planning a huge English Ford/Vintage race weekend. English Ford "car corral",with all the "usual suspects". Is it July 2015 or 2014? I couldn't find anything on there website about it. 2015 - it's still being put together. I'll post more details as it gets closer. Yes it is in fact 2015. We needed a big head start to make an event of this nature worthwhile. and yes, there is nothing on the website as of now. Large kudos to Norm Murdock who stepped up after i told him of my intent to do this event, and has already helped out a great deal. For those not in the know, Waterford Hills is a club owned and operated track founded in 1958. A 1.5 mile track full of twists, turns, hills etc. It offers 80% total track viewing from many vantage points, making it a great spectator track, not to mention the challenge for the drivers. IF there was ever a time to make a gathering of Enfo fans this could be it. Also in the area is the Woodward Dream Cruise. If you have never attended, the best time to visit the area is the 2-3 weeks BEFORE the cruise. The day of the cruise is actually the worst day to attend. Not to forget the Henry Ford Museum. The event will take place the last full weekend in July. We run the event like a slice of sports car racing in the sixties / seventies. Cheap to get in, parking on the grounds. ( you can walk the whole grounds with ease ) National Anthems, Announcers, Victory laps, etc. We would be thrilled and honored to have a parking lot full of ENFO, to match on what we feel will be a good paddock full to match. Hope we see all there! Waterford Hills Vintage Event Chair. Always looking for a Mk-2 Estate. Does that mean you are working on the Cortina racecar I sold you? I think that means i am storing the race car you sold me. She is doing fine . Living in a dry garage,,,i started to take her apart, and stopped at the point of "common sense"
She is good, she has new shoes, and a new wardrobe on the way. Updates, with a lot more to come. proper updates on the Waterford Hills website to follow soon. to the East Coast in September. 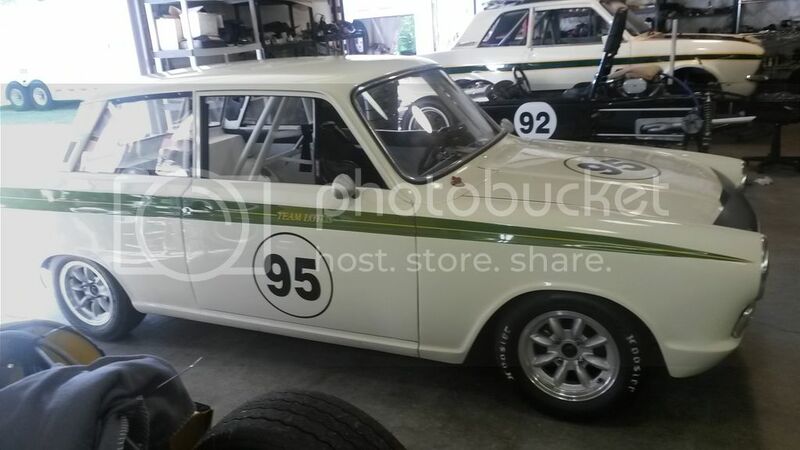 We just finished the Cortina today and will be loading her up tomorrow! Looking forward to a fun shakedown weekend! Unfortunately the MkII GT will not be joining us. The car looks great even standing still, good luck. I plan on having two GT 2-doors and an Estate in the corral.